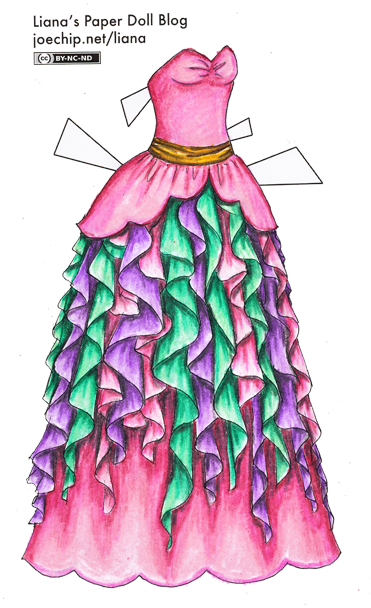 I was thinking about maybe the Japanese “color dress” in pinks and greens and violets with maybe some gold as an accent on the sash..? You might have noticed I don’t do pinks all that well, but I gave it a shot. (This is actually the reason I worked on my color chart yesterday. So thanks, Hannah, I might have never got around to replacing it otherwise…) Actually the finished dress reminds me of the Barbies I played with when I was a kid in the 80s. Totally Ruffles Barbie, anyone? Anyways, I hope you like it, Hannah! This is my color warmup week, because you know what’s coming up? Halloween! October’s always been my favorite month to paperdoll, what with the Cursed Sisters and the Good Queen and all my other beloved costumes. And I’ve got plans for this October, oh yes I do… So I need to get well reacquainted with my Prismacolors before then. I’ve got Wednesday and Thursday covered with one for Diane and one for Brian, so that means I need someone to boss me around on Friday, too… Why not — this calls for another contest! I’ve certainly written about books that are among my favorites, but I don’t think I’ve ever written on this site what exactly my favorite book is. If I did and forgot about it, feel free to use my spotty memory against me, but don’t bother googling “liana kerr favorite book,” I tried that already. I really like dress. Even though I don’t really like pink this one is so cheerful and happy it’s hard not to like it. Now for the contests. For the number of visitors I guess 3,469. War and Peace by Tolstoy? I’m sorry to say that I am not guessing. :( As I don’t really read the long posts, because I like seeing the dresses for a story I’m writing. This does remind me of a barbie dress… And were I still an eight year old girl, I would want that Barbie very badly. Actually, I was never that into Barbie. I was more of an American Girl dolls and Ginny dolls sort of child. Lord of the Rings/the Hobbit? I’m going to guess… Dune by Frank Herbert. Wait just a minute-you have a favorite book!?!? Over the course of your life? Your first favorite book was Puppies…I still remember much of it…Puppies pop up everywhere. They follow you where ever you go….Hmmm…now that you live here I may give it back to you for your library. So you are going to contend that if you had to choose one book as a favorite you could do that? Get real. I’m waiting for this contest answer. Ummm…Hitchikers Guide to the Galaxy??? The 100 Dresses by Elenore Estes and Louisia Slobodkin? Your paperdolls and dresses are wonderful and make my 3 granddaughters very very very happy! I love to come and look at your paper dolls, especially when you dip into imagining literature. I like the colors. :) very pretty. I love it! I was picturing it differently in my head, but I think I like this version better. It kinda reminds me of the water bottle I have that’s done up in classic ’80’s cyan and magenta and purple, that held SO much ice water and was SUCH as blessing when playing field-sports on a hot day. So it’s bringing back good memories for me too, just not with Barbies. Wow. I cannot give a short comment. this one is beautiful! My favorite colors, too. :) I am honestly inspired by your work. :) Good luck in creating more wonderful gowns. I loove this one. The ruffles look fantastic.